Born on August 27, 1922 in Poland to a Jewish family that relocated to Mexico City in 1937 when WWII began. At the young age of 17, she began her artistic career when she started studying at the Escuela Nocturna para Trabajadores No. 1, receiving her first drawing lessons from Santos Balmori. After that she was hired by David Alfaro Siqueiros to decorate the murals of the Mexican Syndicate of Electricians and by Diego Rivera to work on the murals at the Palacio Nacional. She studied at the Esmeralda School of Fine Arts from 1940 to 1945 where she had the tutoring of superb artists like Feliciano Peña, Orozco Romero, Francisco Zuñiga, Frida Kahlo and Diego Rivera. 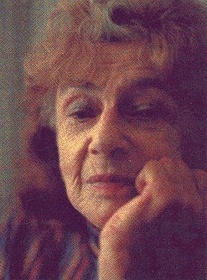 In 1943 she also studied graphic arts with Diaz de León at the Escuela de Artes del Libro. Her first public solo exhibit was held in 1941 at the Liga Popular Israelita in Mexico City. From the first time she stepped on Mexican Soil, she familiarized herself and adopted the nationalist movement that was felt through the country. Her themes, compositions and the techniques were all characteristic of the concepts of social realism which most great artists of the time tried to portray. She executed several important murals with these themes. "The Unity of Single Mothers", "Alphabetización", "A Surviving Town", "The Constitution" and "Mexican Family" are just some of her famous murals that dealt with social issues. She traveled extensively and constantly, and this experience has allowed her to gain new forms of expression and kept her work from getting stale. There are three clear eras in her work; the first which was influenced by the Mexican School; the second where we see her inclination towards expressionism and the third that is characterized by the display of anguish towards oppression and inherent catastrophe that the megalopolis brings with it, a criticism on the destruction of Mexico City by it's own unconstrained growth. Rabel was founding member of the Salon de la Plastica Mexicana and the Taller de la Grafica Popular in 1950. In 1993 the Instituto Nacional de Bellas Artes recognized her 50 years of dedication to the arts with an exhibition that showed her life's work in the museum at the Palacio de Bellas Artes. Fanny Rabel, died on Tuesday November 25, 2008 at age 86 in Mexico City. Her body was buried at the Panteon Israelita.